P22 Type Foundry is dedicated to producing quality fonts and related products. Our goal is to present historical materials in a contemporary, relevant form. By doing so, we make great art and design accessible to every level of computer user. Our research and design teams are committed to developing typefaces which are not available anywhere else. P22 works closely with museums and foundations toward the development of historically and aesthetically accurate products. Each font set is uniquely packaged with background information on its source and inspiration. We hope you enjoy our fonts and we welcome your input. The world around us is full of imagery, ideas and artifacts. Often the original sources for shared visual vocabulary are unknown and “new” ideas are little more than warmed-over experiments from decades or centuries past. P22 type foundry began as a vehicle for resurrecting lost artifacts in the “ready-made” ethos of Marcel Duchamp, but it has also appreciated the Arts and Crafts philosophy of making things with your hands in an honest and genuine fashion. These two worlds of Dada randomness and hand-craft may seem to be at odds with each other, but add a Macintosh computer and they suddenly make sense. P22 began creating fonts in 1994. These fonts were based on the handwriting and imagery of surrealist artists Marcel Duchamp and Joan Miró. These were not typefaces in any traditional sense. The Duchamp font was an attempt to use Duchamp’s own methods of random selection and appropriation in a self-referential homage. The Miró font was an attempt to extract a full alphabet from the forms found throughout Miró’s “Constellation” series of paintings. 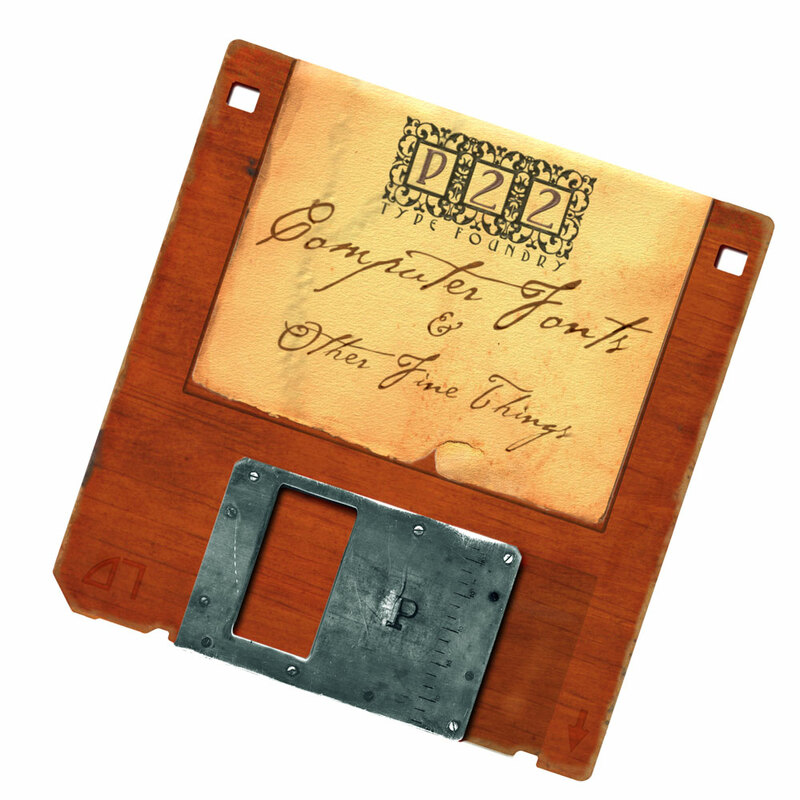 Both fonts were packaged with a simple flat card and a floppy disk and sold in museum gift shops. This was the beginning of P22. The interest generated by these two font sets inspired P22 to work on revivals of actual type designs that had never before been available in digital form. After the Josef Albers set, created in collaboration with the Guggenheim Museum in New York and the Daddy-O “beatnik” set for the Whitney Museum of American Art both proved successful, a world of possibilities opened up. For example, a children’s font set was created by commissioning a five-year-old child to design all 256 characters in the Western European ASCII font set. At that time, all P22 font sets were sold primarily through museum gift shops because of a logical yet untapped marketing opportunity: designers buy fonts, and designers go to museums — a captive audience! Before P22 type foundry became a real entity, the name P22 was used for a variety of projects including a tiny letterpress print shop, a coffee-table-silk-screen-kit-T-shirt company, a snow sculpting team, and a few other prankster art deeds best left undocumented. The name itself has no intended meaning. It was chosen as the mysterious fictional multi-national umbrella corporation which tied these varied projects together. The name P22 was found on a rubber stamp and could well have been any other random combination of numbers and letters.